We know the sports axiom that a player doesn’t lose his starting job when he is injured. Except perhaps if his team needs that player to help stabilize its reserve unit and depth. Perhaps the Bulls will have more good fortune in the regular season this time. The Bulls Tuesday lost their second straight preseason game—after going undefeated in last year’s preseason—111-109 in overtime to the Detroit Pistons. 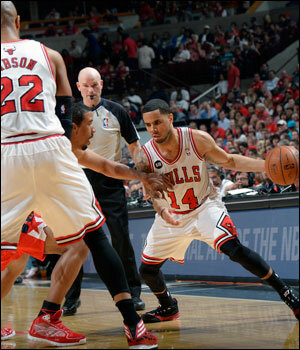 The Bulls Monday opened the 2014-15 preseason with an 85-81 loss to the Washington Wizards. Though, unofficially, make it 1-0 for the Bulls. Derrick Rose with 11 points and four assists in just under 14 minutes and one-of-two on threes was the best player on the floor, albeit as little he played and only in the first half.